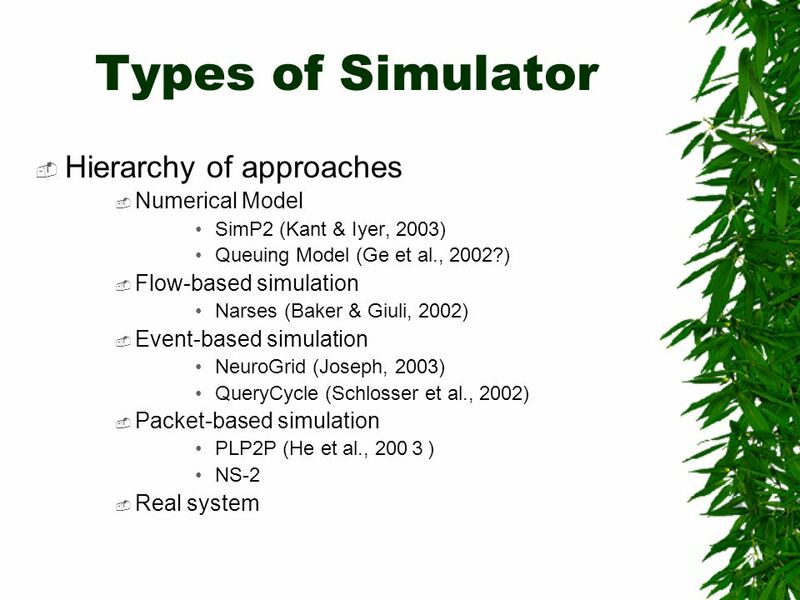 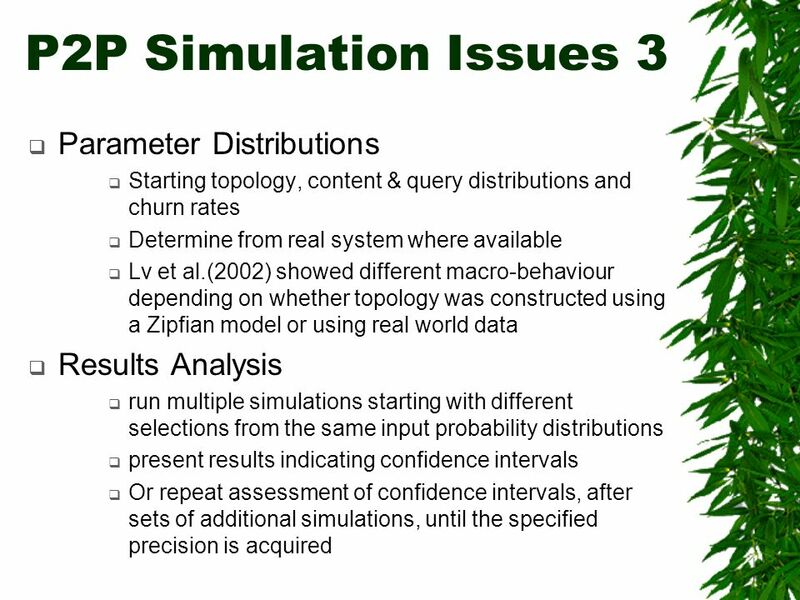 4 What is a simulation? 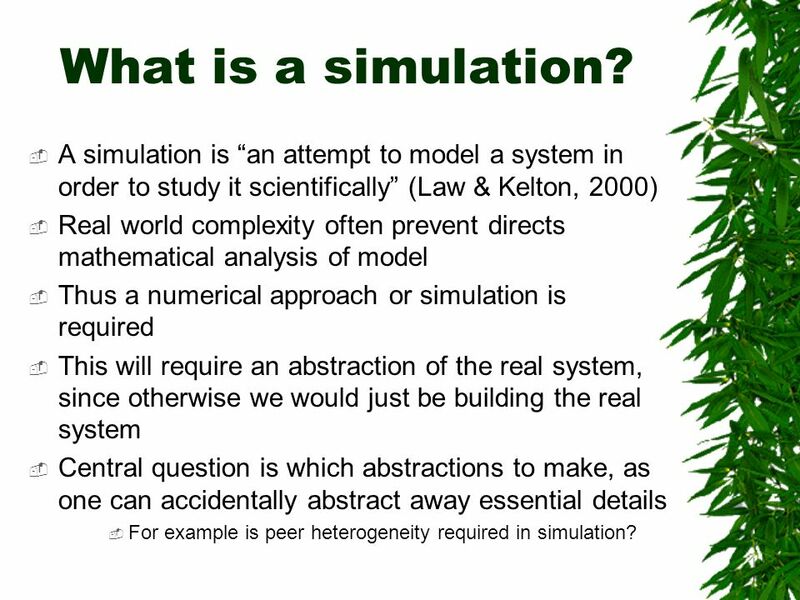 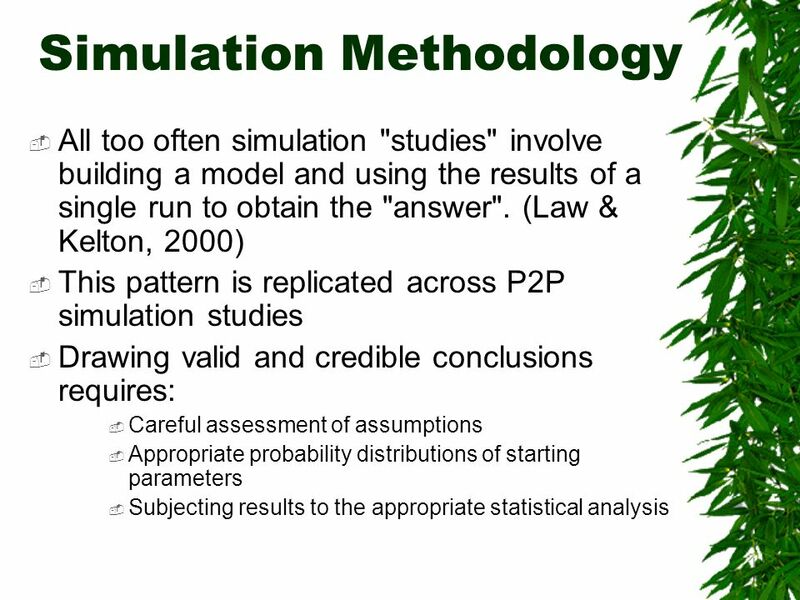 A simulation is an attempt to model a system in order to study it scientifically (Law & Kelton, 2000) Real world complexity often prevent directs mathematical analysis of model Thus a numerical approach or simulation is required This will require an abstraction of the real system, since otherwise we would just be building the real system Central question is which abstractions to make, as one can accidentally abstract away essential details For example is peer heterogeneity required in simulation? 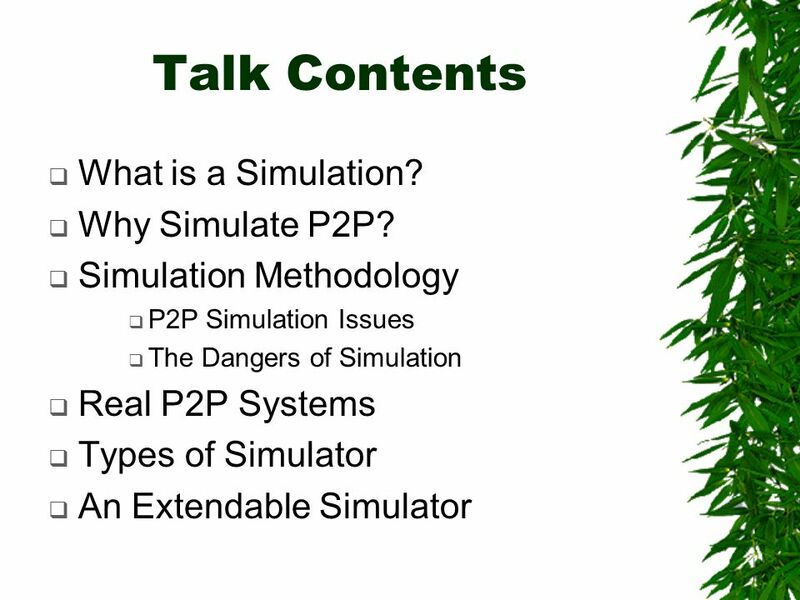 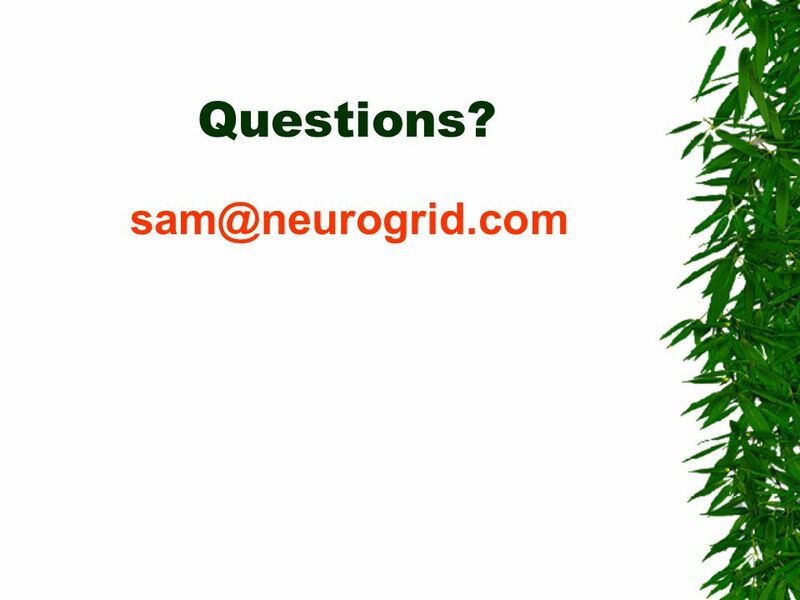 5 Why Simulate? 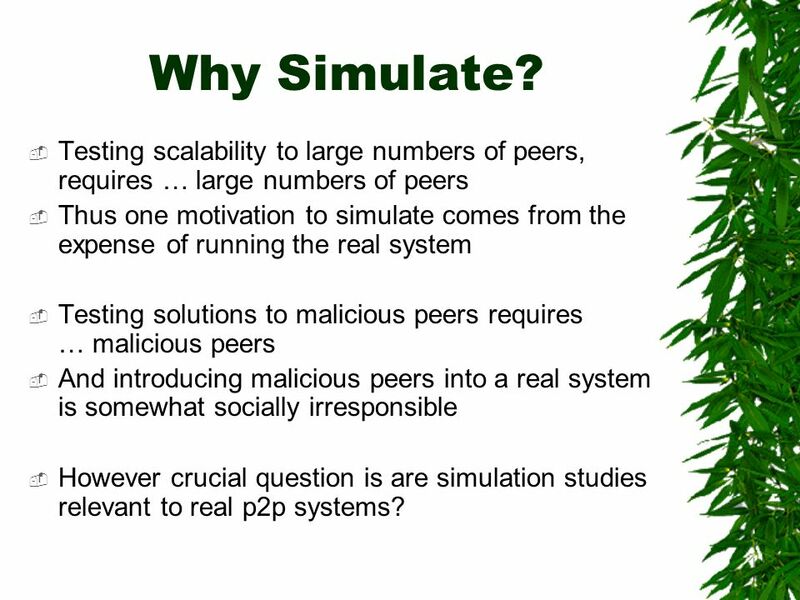 Testing scalability to large numbers of peers, requires … large numbers of peers Thus one motivation to simulate comes from the expense of running the real system Testing solutions to malicious peers requires … malicious peers And introducing malicious peers into a real system is somewhat socially irresponsible However crucial question is are simulation studies relevant to real p2p systems? 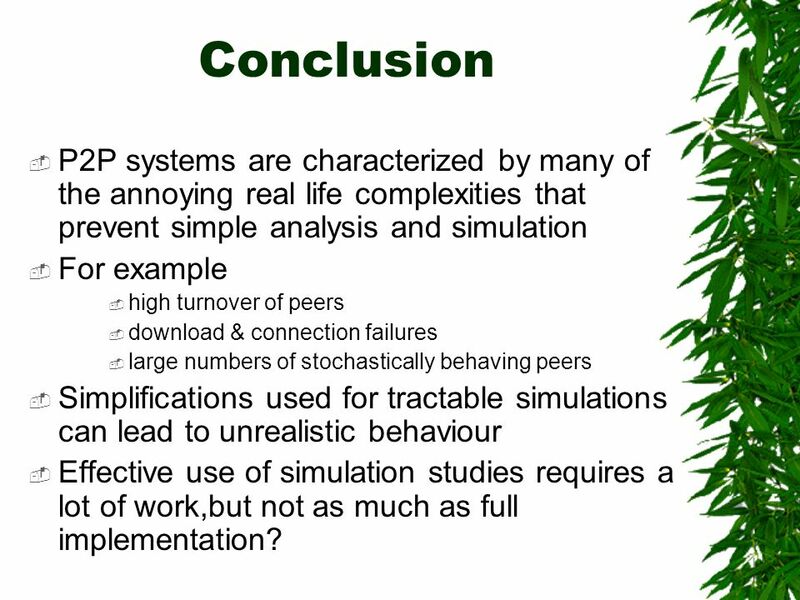 15 Conclusion P2P systems are characterized by many of the annoying real life complexities that prevent simple analysis and simulation For example high turnover of peers download & connection failures large numbers of stochastically behaving peers Simplifications used for tractable simulations can lead to unrealistic behaviour Effective use of simulation studies requires a lot of work,but not as much as full implementation? 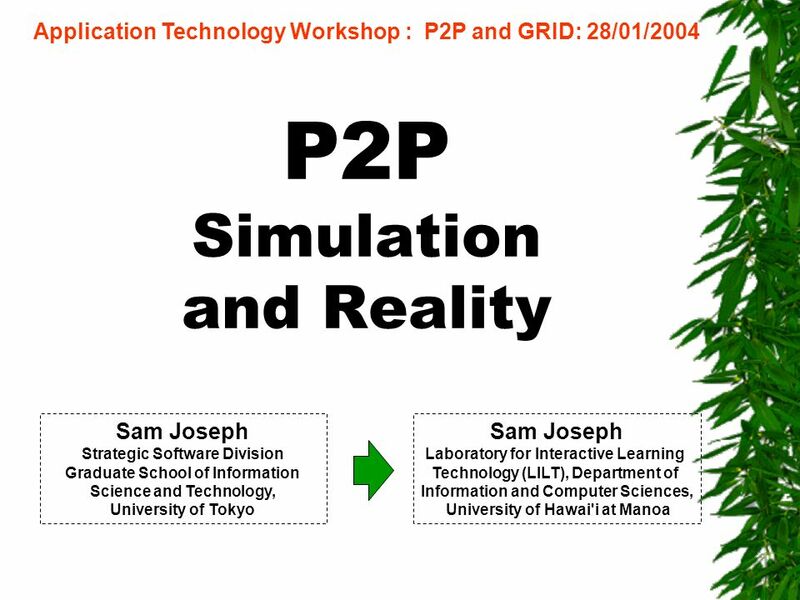 Download ppt "P2P Simulation and Reality Application Technology Workshop : P2P and GRID: 28/01/2004 Sam Joseph Laboratory for Interactive Learning Technology (LILT),"
SkipNet: A Scalable Overlay Network with Practical Locality Properties Nick Harvey, Mike Jones, Stefan Saroiu, Marvin Theimer, Alec Wolman Microsoft Research. 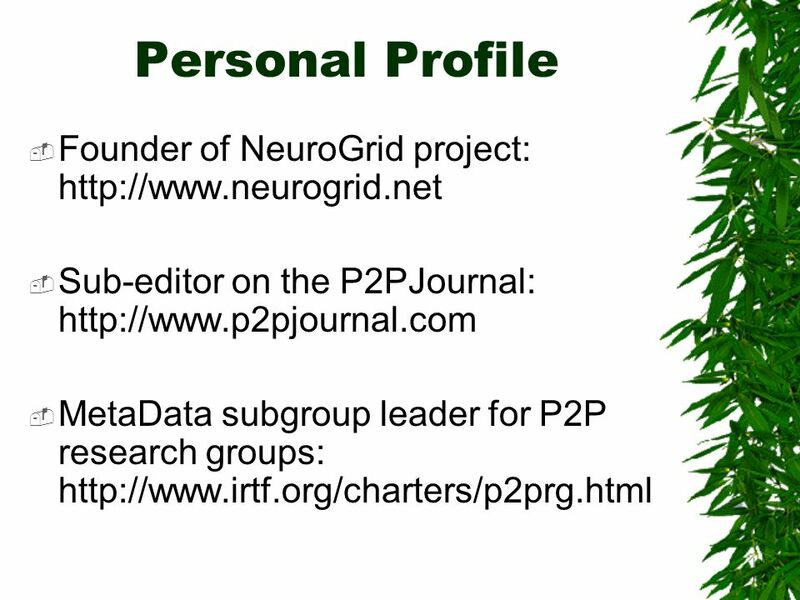 Peer-to-peer and agent-based computing P2P Algorithms. 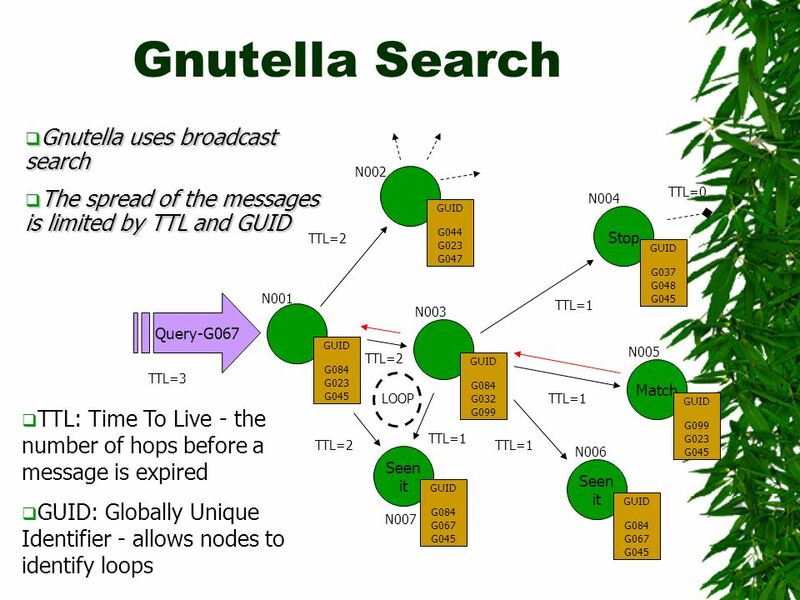 One Hop Lookups for Peer-to-Peer Overlays Anjali Gupta, Barbara Liskov, Rodrigo Rodrigues Laboratory for Computer Science, MIT. 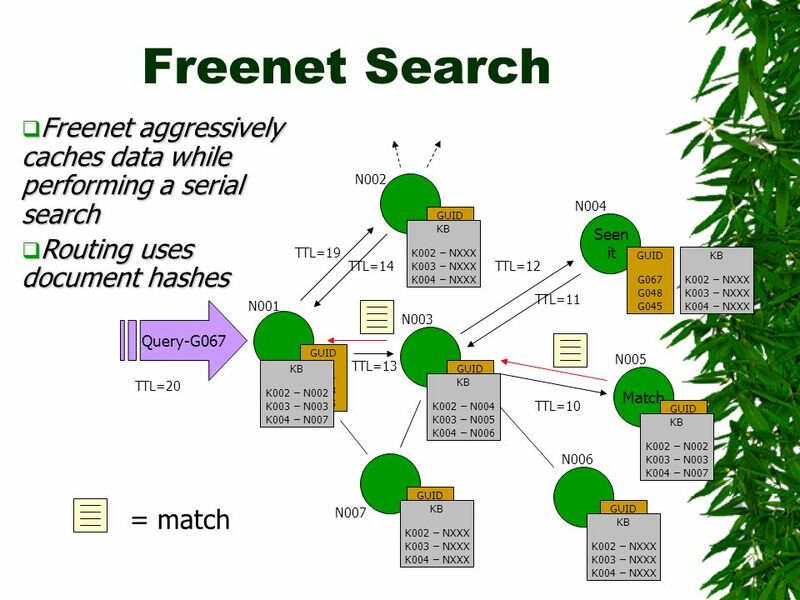 Technion –Israel Institute of Technology Computer Networks Laboratory A Comparison of Peer-to-Peer systems by Gomon Dmitri and Kritsmer Ilya under Roi. 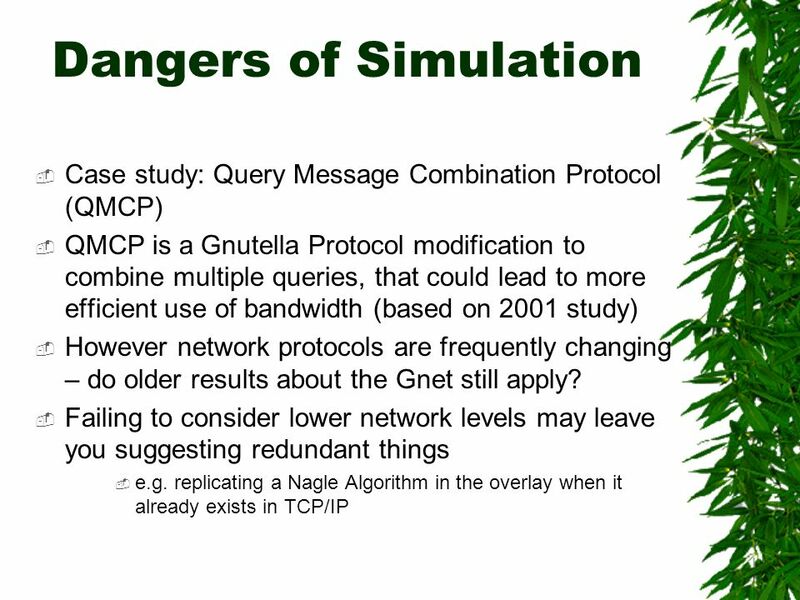 Building Low-Diameter P2P Networks Eli Upfal Department of Computer Science Brown University Joint work with Gopal Pandurangan and Prabhakar Raghavan. 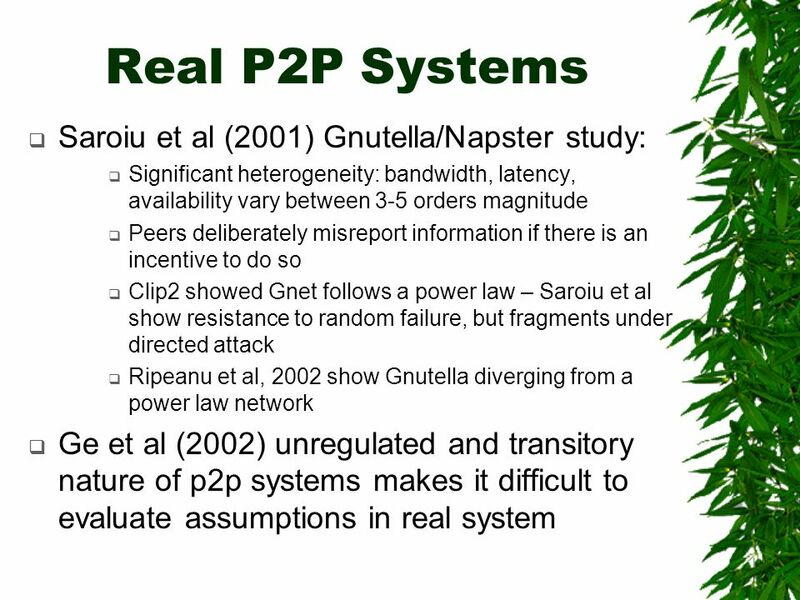 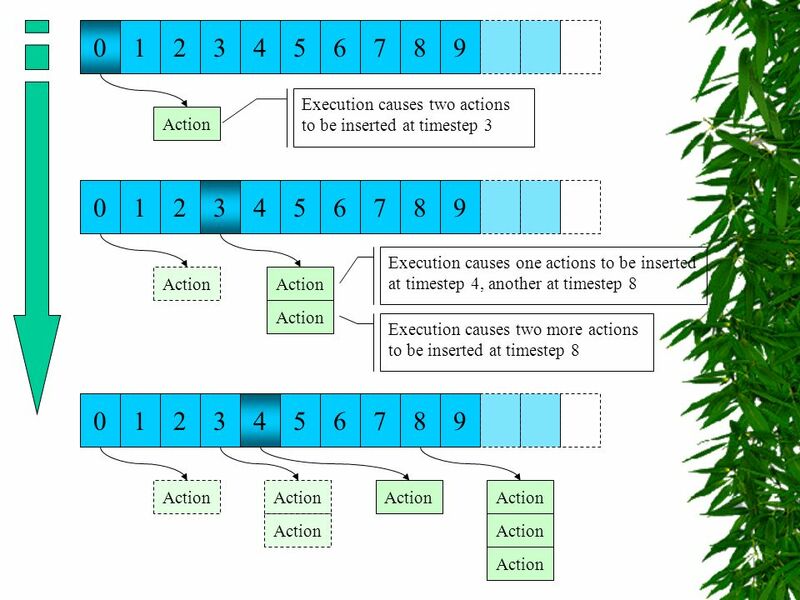 Efficient Content Location Using Interest-based Locality in Peer-to-Peer Systems Presented by: Lin Wing Kai. 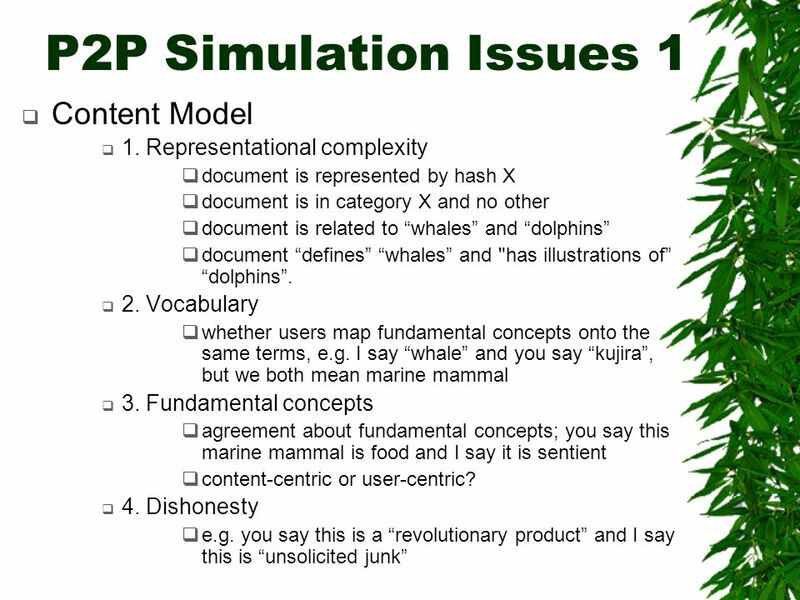 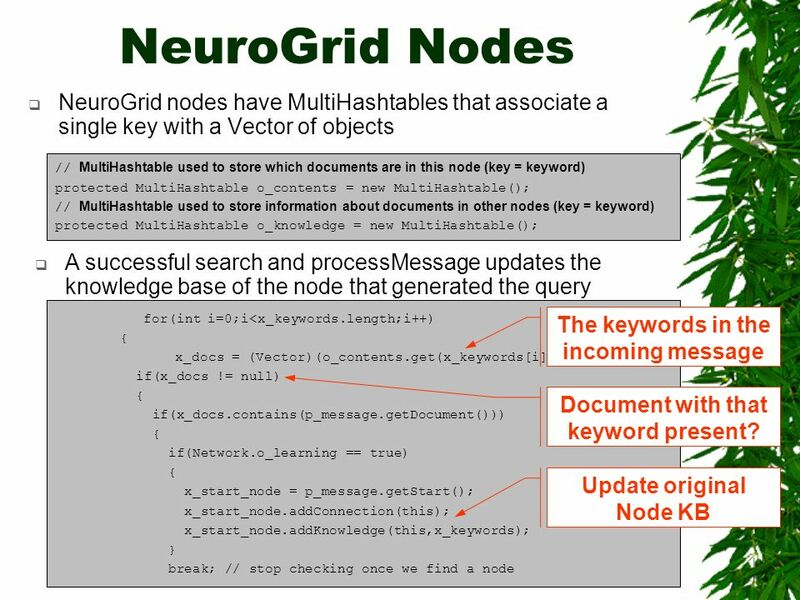 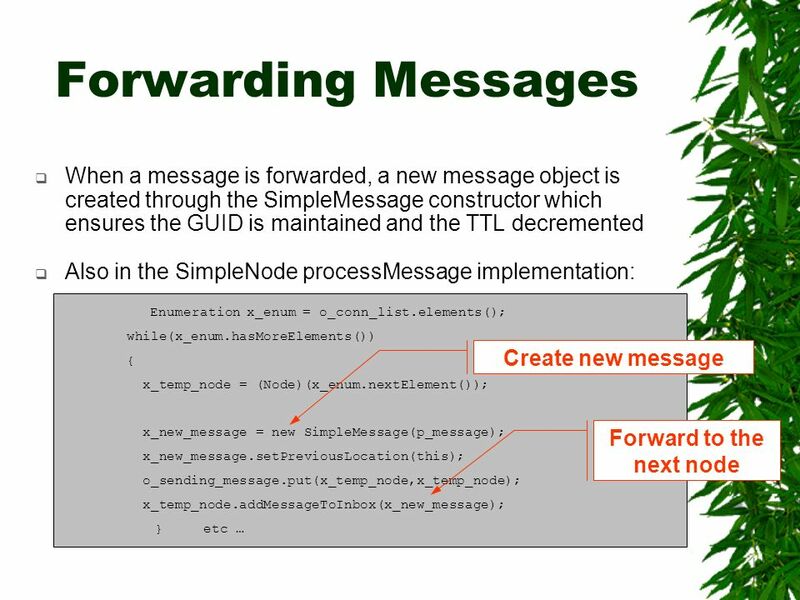 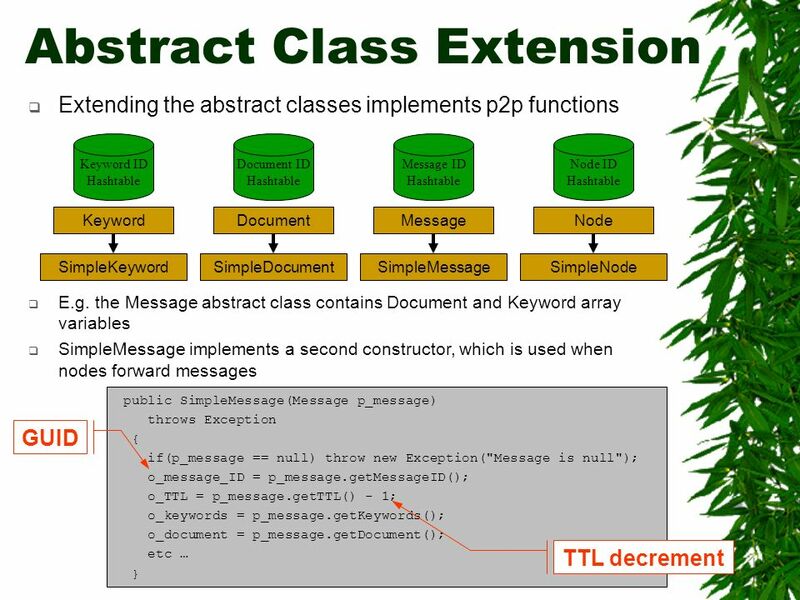 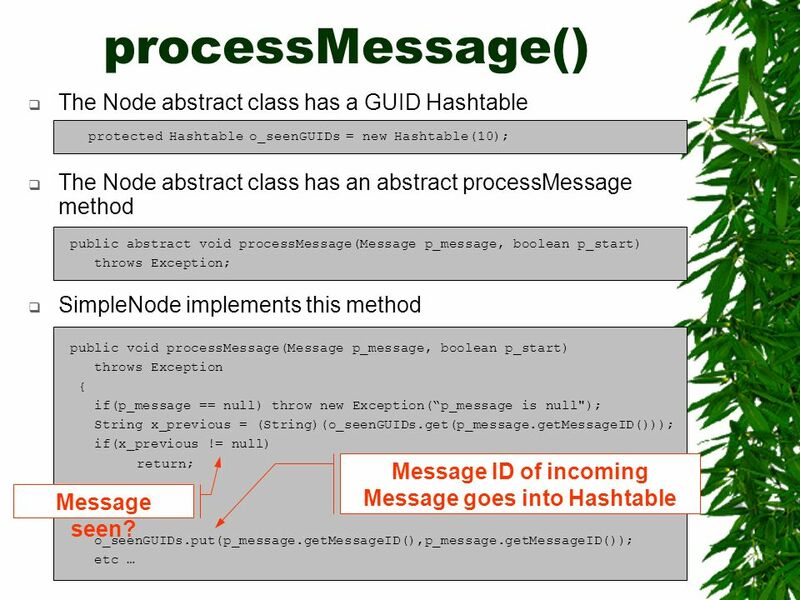 Adaptive Content Management in Structured P2P Communities Jussi Kangasharju Keith W. Ross David A. Turner. 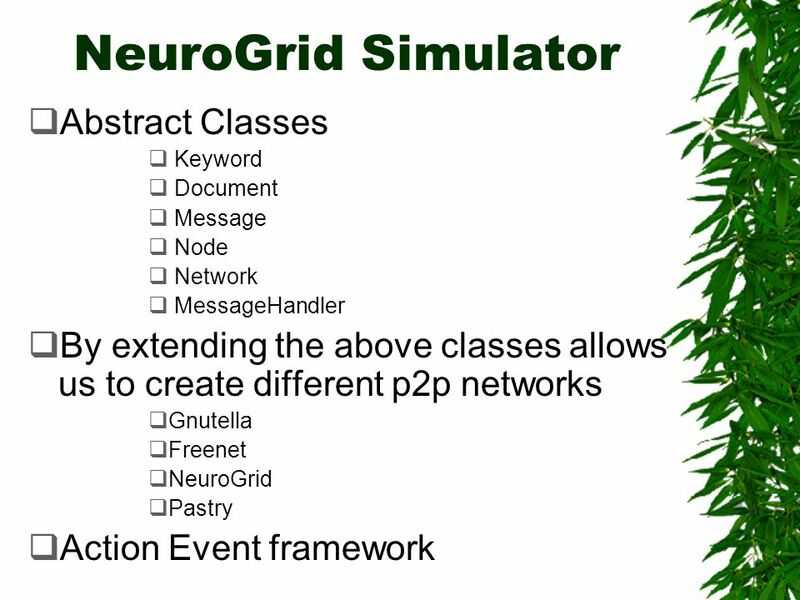 Overlay Networks EECS 122: Lecture 18 Department of Electrical Engineering and Computer Sciences University of California Berkeley. 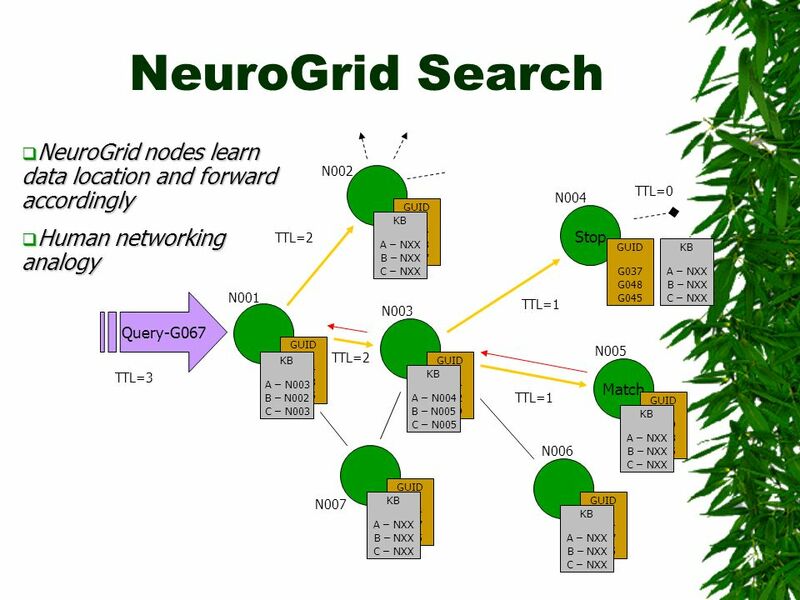 Self Healing Wide Area Network Services Bhavjit S Walha Ganesh Venkatesh.